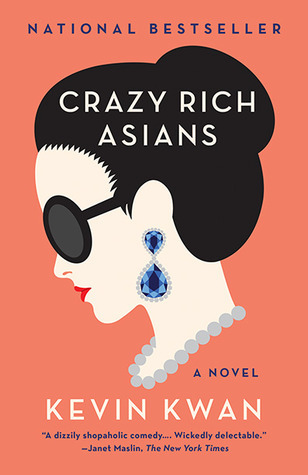 The “rich” in this novel’s title is a vast understatement. These are people who own five homes, fly only on their private planes, and spend $250,000 on a single dress. It’s absurd…which is exactly why I lapped up ever juicy page. I had no idea that this level of wealth existed, nor does Rachel Chu when she agrees to go to Singapore with her boyfriend Nick and then spend the next months traveling on vacation. She has no idea what kind of well connected – royal, even – family her boyfriend of two years is a part of. Of course, his private family sniffs her out and assumes the worst. She’s not rich and therefore must be a gold digger and not up to standard. From the moment she arrives in Asia, Rachel is awed by the extreme opulence and basically goes from one over the top event to another while Nick’s family judges her behind her back. This novel seems too wild to believe. Nobody actually lives like this, do they? Where Gucci is trash? What? But as I Googled author Kevin Kwan, I learned that he actually grew up in a similar environment. While the book is a work of fiction, Kwan admits he was inspired by his own family. That means parties this insane actually exist. This is a whole other level.